It seems most probable that the “tongue” in the title of Louie Skipper’s new collection is meant to connote language, or a way of speaking—the “tongue” of poetry. In fact, in the book’s title poem, the speaker acknowledges that he’s “planned the jailbreak of these words from within, / my scratching of ink.” Yet I couldn’t help but think, as well, of the concept of speaking in tongues—praise and consolation—as I read these lyrical and well-made poems. That religious connotation of “tongue” also seems appropriate, given that Skipper is an ordained Episcopal priest. the blessedness of a simple man, I thought. Such poems project a profound reverence for the natural world, while implicitly acknowledging a higher power, “God who kept daydreaming of returning / to who we are and learning us completely, / trying to forget / what part of him still belonged to the moving, frozen sky” (“Asking the Rose”). That echoing of racial tension in the “black sinews” and “white bones” is typical of Skipper’s methods in the book, a need to draw together disparate threads and make new uses of them as the poems progress, an inclusiveness that rarely oversteps or feels heavy-handed. Could you ever hope to meet a sweeter guy? Chipper, that, even jaunty, in the face of finality. 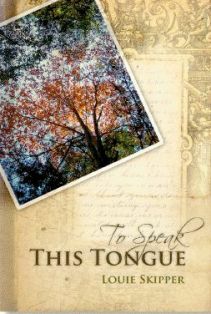 To Speak This Tongue is unflinching that way. Russ Kesler's second collection of poetry, As If, is just out from Wind Publications.